Here are some Barry Sanders apparel and clothing pieces of interest. Whirling, spinning, weaving, and dodging, he created a highlight real every time he carried the ball. Remember his incomparable style with this Barry Sanders Detroit Lions. 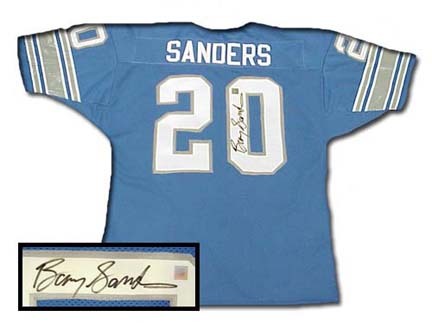 Enjoy this autographed authentic NFL Detroit Lions jersey signed by Barry Sanders. A great collector's piece for all Detroit Lions fans! He's your favorite old school player and now you can proudly show it, with this new Barry Sanders Detroit Lions Premier vintage jersey from Reebok. This nylon/polyester Replithentic delivers superb value by combining quality and details that approach those of an authentic jersey with affordability rivaling that of a replica jersey. Features raised applique numbers on front, back and shoulders, and Barry Sanders' name across the back in a traditional 'stitched' look. Includes torso section made of cool, 'breathable' poly mesh, embroidered upper center front NFL Shield Sewn NFL Throwbacks and Player Name and Year labels on front left hem. Officially licensed by the NFL. Barry Sanders authentic Russell Athletic Oklahoma State orange jersey - these are the Official Throwback jerseys. This 100% heavy-duty mesh jersey has all name and numbers sewn-on, as well as 'OKLAHOMA STATE' sewn on the front, and has a Barry Sanders Officially Licensed Product tag for added value and quality assurance. 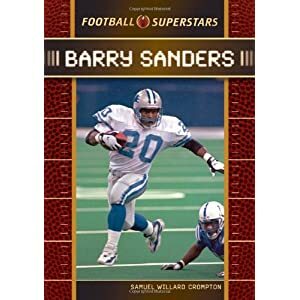 Book about one of the best running backs of his time, Barry Sanders. Book is in library binding.